Game of Throne is a show that has its share of big moments. 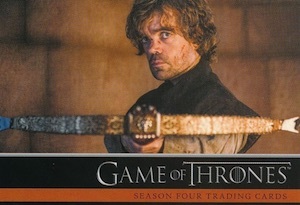 The fourth season was no different, delivering shocking deaths, new characters and epic battles. 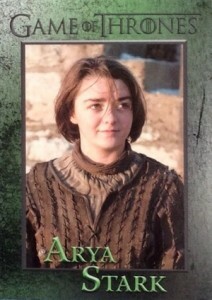 They're all captured in the 2015 Rittenhouse Game of Thrones Season 4 trading cards. Boxes deliver a pair of autographs as well as a mix of new and returning inserts. The base set has 100 cards, which is big for an entertainment release. Like previous releases for the show, character biographies play a big part. More than 60 characters are showcased with their own cards. 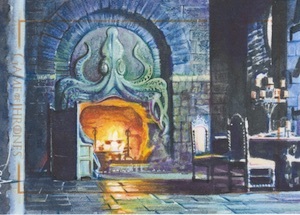 The season's ten episodes are also recapped in the set. The base set also has a Gold parallel. Numbered to 100, there's one per box. 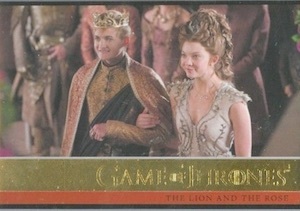 The main chase in 2015 Rittenhouse Game of Thrones Season 4 is for autographs, which are inserted 1:12 packs. Signers include Peter Dinklage (Tyrion Lannister), Sean Bean (Ned Stark), Kit Harington (Jon Snow) and Lena Headey (Queen Cersei Lannister). 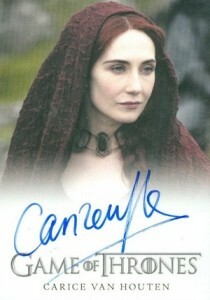 Previous Game of Thrones sets have had extensive autograph checklists with multiple designs. 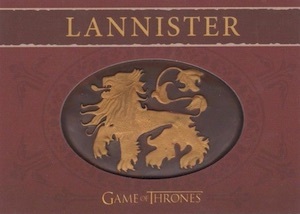 New to 2015 Rittenhouse Game of Thrones Season 4 are Shield pin cards (1:144). Each has a pin embedded into the card and comes numbered to 300. Six cards are in the set. Sketch cards, some of the most valuable cards from earlier releases, are also randomly inserted. These have artwork done on the card itself. 2015 Rittenhouse Game of Thrones Season 4 has three basic insert sets as well. 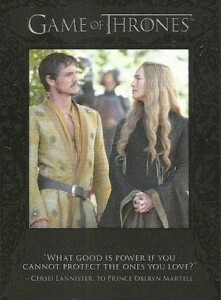 Quotable (9 cards, 1:12) return with some of the most memorable lines of the season. 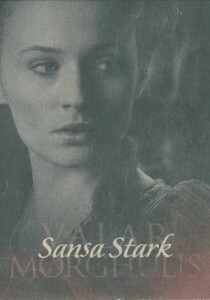 Valar Morghulis translates into "All Men Must Die." It also translates into a large 20-card insert that lands 1:24 packs. 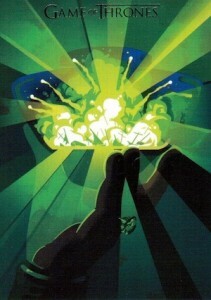 Inserts are rounded out by Beautiful Death art cards (20 cards, 1:24), which also have a Gold parallel (#/100, 1:144). Cases come with an embossed Raven Poster card. 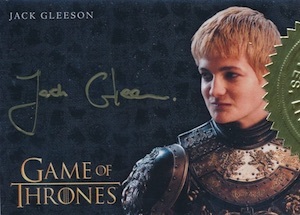 2015 Rittenhouse Game of Thrones Season 4 also has three multi-case incentives: Jack Gleeson (King Joffery) Gold Autograph (six cases), Kit Harington (Jon Snow) Gold Autograph (nine cases) and an Archive Box (18 cases). The Archive Box has an exclusive Hand of the King pin card that's not available anywhere else. 48 Sandor Clegane "The Hound"
6 cards. Serial numbered #/300. Combine with Sketch cards to fall 1:144 packs. Combine with Shield/Pin cards to fall 1:144 packs. 1 card. 1 per case.